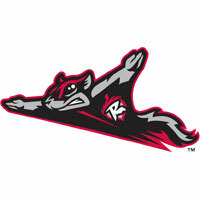 The Richmond Flying Squirrels (39-35) snapped a 29-inning scoreless drought to score twice in the seventh inning and stun the New Britain Rock Cats (41-35), 2-1, on Monday night at New Britain Stadium. The Squirrels were shut out, 1-0, as the two teams also completed a suspended game from Saturday night. The series was abbreviated to just two games. It marked the final ever regular-season trip to New Britain Stadium for the Squirrels. Saturday’s ballgame resumed in the fourth, and New Britain wasted no time taking the lead against right-hander Joe Biagini. Mike Tauchman got things started in the fourth with a single to left field. Trevor Story followed and looped a single to center field. Tom Murphy then cracked a single to left-center field to bring in Tauchman for a 1-0 lead. Biagini (6-5) was lifted for a pinch-hitter in the seventh inning and worked just three innings. He was charged with the lone run on three hits, walked one and struck out four. He took his second consecutive loss against the Rock Cats and fifth of the season. Right-hander Matt Flemer (4-3) had little trouble after picking up the game in fourth inning. He earned the win over five scoreless innings. He was charged with no runs on four hits. He walked none and struck out two. Right-hander Carlos Estevez worked a scoreless ninth inning to earn his first save. The Squirrels were shut out for a third consecutive ballgame, the first time it had ever happened in franchise history. Lefty Adalberto Mejia and righty Ryan Arrowood battled in game two. Each turned in five scoreless innings. Mejia did not allow a hit until the fifth, while Arrowood called it a night after five innings. Arrowood did not factor in the decision, allowing four hits. Mejia continued to the sixth and the Rock Cats finally got to him. Jayson Langfels led off and doubled to the left-field corner. Langfels was bunted to third by Pat Valaika and scored the only run when the suicide-squeeze was executed perfectly by Mike Tauchman. The lone run was all that Mejia (3-0) allowed and he earned the win as the Squirrels rallied in the seventh. Richmond, shut out for 29 consecutive innings offensively, finally came alive in the seventh against right-hander Austin House. The inning was sparked when Myles Schroder struck out but reached on a wild-pitch. Jackson Williams followed with a single to put two aboard. Jesus Galindo popped up a bunt, but Hunter Cole delivered a pinch-hit infield-single to load the bases. Engel Beltre popped out, but Rando Moreno then delivered a game-winning two-run double to left-center field. House (0-4) took the loss for the Rock Cats. Right-hander Derek Law allowed a flare-double in the bottom of the seventh, but nailed it down from there to earn the save – his first. The Squirrels continue their week-long road trip as they open a four-game series against the Harrisburg Senators (Washington Nationals) at Metro Bank Park on Tuesday night. The opener is scheduled for 7 p.m. as Richmond RHP Tyler Beede (1-2, 5.01) will make the start against Harrisburg LHP Richard Bleier (5-2, 3.13). The Flying Squirrels Pregame Warmup will begin at 6:30 p.m. on Fox Sports 910 and FoxSportsRichmond.com.